Left: the name Lo’s Mee Kwong lives on in the LMK Development Estate in Kwai Chung; Centre: an advertisement from the early 1980s promoting the “colorful world” of Join-In Shirt; Right: Early 1980s picture of Join-In Estate (now Prosperity Centre) in Kwai Chung. From the late 1970s to early 1980s, Join-In Shirt (鍾意恤) manufactured by Lo’s Mee Kwong Garments (羅氏美光製衣廠,hereafter referred to as LMK) was a major apparel brand in Hong Kong. LMK was more than just a shirt maker – according to the Far Eastern Economic Review, it was “Hong Kong’s biggest garment-making company” in the early 1980s. In fact, LMK was a pioneer in four major trends in the Hong Kong garment industry – it was one of the first HK garment manufacturers to supply to major retail chains in the West, to acquire a fashion label in the US, to set up production in Sri Lanka and it also established the first 100% foreign owned enterprise in Shenzhen which later became one of the largest textile companies in China. The founder of the LMK group was Lo To-Tak (羅道德), a native of Poleng (普寧) in Swatow. The Lo family fortune was created one generation before by Lo Kung-yin (羅功賢),who immigrated to Thailand at an early age and created wealth through trading in textiles and other goods such as livestock. After the War, Lo Kung-yin expanded into textile manufacturing by establishing Thai Weaving & Knitting Factory and also co-founded the Phow Leng Association of Siam in 1948. Initially the Lo family business was primarily located in several cities in Thailand but in 1938, Kung-yin sent his son Lo Ying-shek (羅鷹石, 1913-2006) to Hong Kong to set up Low Swee Heng (羅瑞興出入口行) and another relative was sent to Singapore to set up a trading post there. Located amongst the Chinese trading houses at Bonham Street East in Sheung Wan, Low Swee Heng made a name in the Siam trade and the Swatow lace and textile business in Hong Kong. In 1951, the Lo family decided to divide up the family fortune and Lo To-tak ended up with Low Swee Heng while Lo Ying-shek moved into the real estate business and eventually founding the Great Eagle Group. (The obituary of Lo To-tak’s mother Madam Cheung in 1969 did not list Lo Ying-shek as a brother so it is likely that they were cousins). From textile trading, Lo To-tak made the natural expansion into garment manufacturing in 1959, when he started the Mee Kwong Garment Factory. (“Lo’s” was added to the firm’s name when Lo’s Mee Kwong Garment was incorporated in 1967.) In the 1960s, its plant was located at 483B Castle Peak Road (Source: Asia Textile Bi-Annual) and business grew as it became a major garment exporter to the European and the US markets (each represented about 40 percent of the business as of 1976 according to a Men’s Wear article). One of its major European clients was Tesco, the massive retail chain in the UK and this close relationship is evidenced by the fact that Tesco chairman Sir Leslie Porter flew to Hong Kong to be the guest of honor at the opening of LMK’s Join-In Estate in 1980 and that Lo was one of the two main external guests of honor (the other being Lee Cheung of the Kwong Luen Tai group, which acquired the Union V-Tex Factory building) next to Porter at the opening of the new Hong Kong office of Tesco at the East Ocean Centre in Tsim Sha Tsui East in 1982. By 1978, LMK Garment had paid up capital of HK$9.2 mil and revenues of HK$140 mil, placing it amongst the leading garment manufacturers in Hong Kong. By the mid-1970s, LMK began a period of rapid expansion as a number of Lo To-tak’s eight sons joined the business, including Eddie Lo Man-pung (羅文彬), Ricky Lo Man-kit (羅文傑), David Lo Man-ching (羅文正) and William Lo Man-lung (羅文龍) with Eddie having the highest profile as the managing director of the group. One of the key initiatives was the launch of its own fashion label in Hong Kong – the “Join-In Shirt” brand in 1974. The name “Join-In” was a clever one as it sounded like 鍾意 (Chung Yee), the Cantonese word for love which was the Chinese name of the brand and why there were hearts in its logo. Although the brand has “Shirt” in its name, like its rival Crocodile it also included men’s casual wear and ladies and children wear, all based on European designs. In its TV and print advertising and fashion shows, Join-In employed Western models and projected an American brand image. By 1977, there were 3 Join-In stores (including one in Ocean Centre in Tsim Sha Tsui and one in Central both of which opened that year) and it also made its products available in department stores and other retail outlets. To further expand its retail footprint and brand image, LMK opened its own Join-In department store in North Point in 1980 across the street from the State Theatre. In 1981, LMK entered the higher priced fashion market in the US by acquiring the controlling interest of one of its clients – New York Sportswear Exchange. The fashion label was created in 1976 as a division of Jonathan Logan Inc (which also owned the Etienne Aigner label) by the scions of two leading American fashion moguls – Robert Ward, the son of Elmer Ward of Palm Beach Inc (formerly Goodall-Sanford; first commercial sponsor of a professional golf tournament in the US) and Richard Schwartz, the son of Jonathan Logan founder David Schwartz. The success of low cost exports from East Asian garment manufacturers like LMK to the US and Europe in the 1960s-70s led to the rise of protectionism in the West and as a result, restrictive quotas were imposed on garment and textile imports from Hong Kong. To get around the issue, HK garment manufacturers began to shift production overseas in countries where there were underutilized quotas and LMK picked Sri Lanka in 1978. There were several reasons why LMK chose the South Asian island nation at the time – under the Multi-Fiber Agreement which came into effect in 1974 (and governed the global garment quota regime until 2004), Sri Lanka was one of the countries with plenty of unused quotas and concurrently, the new Sri Lankan government which came to power in 1977 actively recruited foreign firms to set up factories in new free trade zones as part of their economic liberalization policy. The low cost (US$38 per month at the time which was a fraction of the cost in HK) and skilled labor force was another attraction. In June 1978, LMK signed an agreement with the Greater Colombo Economic Commission to build a 70000 square feet factory adjacent to Colombo International Airport with the capacity to produce 282,000 dozens shirts and jeans per year. Within one month, the factory site which was formerly an expanse of coconut cultivation was cleared for foundation and five months after that, the factory was up and running, making it one of the first foreign garment manufacturers in Sri Lanka. In 1979, it exported US$2.6 mil worth of shirts and jeans to the US. At first the factory was formed as a joint venture with Browns Group, the largest conglomerate in Sri Lanka under the name of LMK Browns (Ceylon) Ltd with LMK only owning 25% but soon LMK acquired the whole firm from Browns and renamed it LMK Ceylon. (M.E. Wijesinghe, Sri Lanka’s development thrust, 1981). As the production cost in Hong Kong continued to soar and mainland China began to open up in the late 1970s, LMK also became one of the first HK garment manufacturers to move its production north of the border. A key figure in facilitating this move was Chuang Shih-ping (莊世平, 1911-2007), the chairman of Nanyang Commercial Bank (now a subsidiary of Bank of China) who was an influential leader in the Chiuchow business community in Hong Kong with strong ties to the mainland government, famous for enticing Li Ka-shing to finance the founding of Shantou University in their native Swatow in 1981. Outside of the manufacturing of garments, LMK became active in property development in the late 1970s. In 1975, the property development arm of the group – Lo’s Mee Kwong Land Investment was established. While the family and the group had also made investments in office buildings such as the 30th floor of the Admiralty Centre in Hong Kong, it placed its heaviest bets in the Kwai Chung industrial area near the container terminal where it purchased large tracts of land and developed the LMK Development Estate in 10 Kwai Ting Road, the 18 storey Join-In Estate (built 1980, re-developed into Prosperity Centre by Tai Hung Fai) in 77-81 Container Port Road (several floors of which was used by LMK itself) and the 13 storey Join-In Hang Sing Centre (鍾意恒勝中心, built 1981) next door at 2-16 Kwaifung Crescent, which was developed in conjunction with Hang Sing Construction, a firm controlled by Eddie Lo’s cousin Anthony Lo Hong-sui, the eldest son of Lo Ying-shek. In November 1983, LMK’s Sri Lankan operations was sold by the receivers to Kellwood International, the American garment manufacturer partly owned by Sears which placed its HK affiliate Smart Shirts in charge of LMK Ceylon’s 1700 employees and 5 year old plant and equipment and most importantly, its large number of garment quotas to the US and Europe. 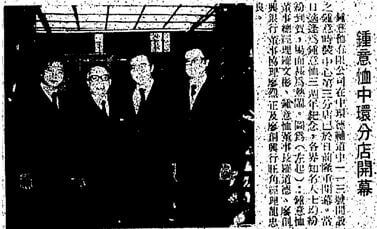 (Wah Kiu Yat Po, 1983-11-17) This became Smart Shirts Lanka Limited and is now part of Youngor Group from mainland China. In Shenzhen, the bankruptcy of LMK-Nam Sang presented some legal challenges initially as it was one of the first foreign investments in post-Mao China to go under. In 1984, the factory was saved by a consortium formed by Union Textiles (華聯紡織, a subsidiary of the Chinese Textile Ministry), Shenzhen Textiles Industrial Co (深圳市紡織工業) and 5 Hong Kong investors (including Qi Li-shi, who was the first to sell mainland Chinese textile in Hong Kong) which took over the plant for HK$25 million and renamed it Victor Onward Textile Industrial (中冠紡織印染). By 1992 it was the largest dyeing/printing firm in Southern China including HK (also referred to as “China’s largest exporter of textiles” in one report) and it became one of the first companies to go public on the Shenzhen Stock Exchange. 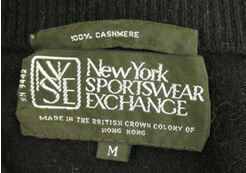 In the US, Phillip Black regained control of the NY Sportswear Exchange label which was eventually discontinued. As for the Lo family, Eddie Lo went through a difficult decade financially and legally after the collapse of LMK. In addition to being declared bankrupt, he was charged alongside his cousin Anthony Lo with defrauding Lloyds Bank. Initially convicted and sentenced to jail in 1986, their names were cleared when their convictions were overturned on appeal in 1987. 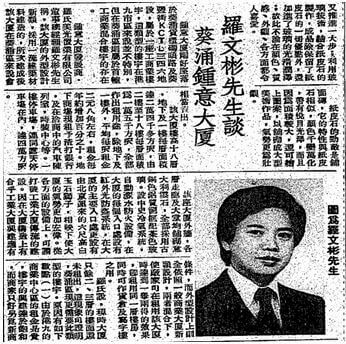 Today he is involved in commercial real estate in HK and Canada and serves on the board of the HK Pei Hua Education Foundation, a foundation he co-founded with Lee Shau-kee, Henry Fok and other HK tycoons back in 1981 (around the time of the establishment of LMK-Nam Sang in Shenzhen) which has funded over 600 short term training programs for over 1 million mainland Chinese personnel in its 35 years of operations. This article was first posted on 2nd January 2017. Off topic, I know, but mention of Mr. Folch Vernet puts me in mind of stories I heard suggesting Folch had other business interests in Hong Kong while working for Lloyds. There was apparently some dispute between Folch and the bank as to the ownership of assets. The bank had some difficulty locating Folch in order to pursue discussions on this matter. What subsequently happened to Folch history does not relate. The group’s US clients included Sears, Kmart, Montgomery Ward, Bloomingdales and Macy’s. Its British clients included Littlewoods, C&A, Take Six, Lord John and British Home stores and the firm also worked with designers such as Christian Dior, Pierre Cardin and Pierre Balmain. In addition to NY Sportswear Exchange, the US division Join-In International also held the license for Etienne Aigner dress shirts, Guy Laroche and Christian Aujard. At its peak, there were 11 Join-In stores in HK.